Aquila constellation, the Eagle, is a northern constellation north sitting above constellation Sagittarius, between constellation Ophiuchus and constellation Delphinus. Aquila spans 20 degrees of the Zodiac in the Signs of Capricorn and Aquarius, and contains 11 named fixed stars. Originally called Vultur Volans or the Flying Grype, Aquila represents the Eagle, thought to be Jupiter himself, that carried Ganymedes to heaven. In mundane astrology Aquila rules the U.S.A., space exploration, bombs and missiles. 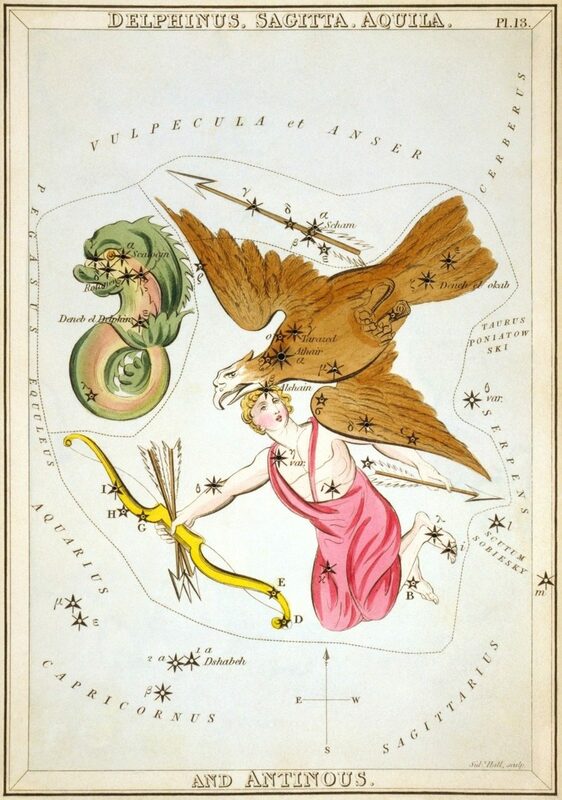 Aquila, the Eagle, next to and westward from the Dolphin, is shown flying toward the east and across the Milky Way; its southern stars constituting the now discarded Antinous. Early representations added an arrow held in the Eagle’s talons; and Hevelius included a bow and arrow in his description. Our constellation is supposed to be represented by the bird figured on a Euphratean uranographic stone of about 1200 B.C., and known on the tablets as Idkhu Zamama, the Eagle, the Living Eye. It always was known as Aquila by the Latins, and by their poets as Jovis Ales and Jovis Nutrix, the Bird, and the Nurse, of Jove; Jovis Armiger and Armiger Ales, the Armor-bearing Bird of Jove in this god’s conflict with the giants; while Ganymedes Raptrix and Servans Antinoum are from the old stories that the Eagle carried Ganymede to the heavens and stood in attendance on Jove. Ovid made it Merops, King of Cos, turned into the Eagle of the sky (he was inconsolable over the death of his wife, and Hera placed him among the stars); but others thought it some Aethiopian king like Cepheus, and with the same heavenly reward. As the eagles often were confounded with the vultures in Greek and Roman ornithology, at least in nomenclature, Aquila also was Vultur volans, the stars beta and gamma, on either side of alpha, marking the outstretched wings; this title appearing even as late as Flamsteed’s day, and its translation, the Flying Grype, becoming the Old English name, especially with the astrologers, who ascribed to it mighty virtue. Then soars to the heights the bird of mighty Jupiter as though, winging its way with wonted effort, it were carrying thunderbolts; it is a bird worthy of Jupiter and the sky, which it furnishes with awful armaments. 1. Fixed Stars and Constellations in Astrology, Vivian E. Robson, 1923, p.29. 2. Star Names: Their Lore and Meaning, Richard H. Allen, 1889, p.55-56. 4. The Witness of the Stars, E. W. Bullinger, 17. Aquila (the Eagle). Big big thanks for information …. But little thing need to re correct …. Alshain it’s wrong name …. The correct name is al – shaheen …. Name الشاهين and I have mercury in 2 degree of aquarius actually in al shaheen star ….. Thanks a lot and you have most great astronomy website …. God Allah bless you …. Thanks so much, very helpful.